Certikin International has introduced a trio of robust ‘plug and play’ Fantasy Roto Spa hot tubs for its Caldera Spas dealer network to target the entry-level market. 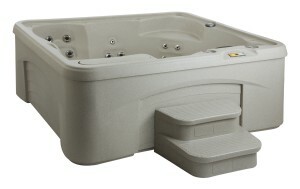 The three Fantasy Roto Spa models have been produced with technologically advanced polymers in a RokSolid shell and cabinet by Watkins Manufacturing. The USA manufacturer is providing them for its Witney-based exclusive UK distributor Certikin International to introduce to Caldera Spas retailers who require a low-cost and user-friendly hot tub option in their showroom. Retailers have the choice of the three-seater ‘Embrace’, four-seater ‘Drift’ and five-seater ‘Entice’. They come in two colour options of Granite and Sahara and have been designed to be virtually impervious to the elements, as well as being easy to clean. Hydrotherapy jets have also been included in the design, to allow users to target neck and shoulder muscles. With its diminutive unique shape, the Embrace is the smallest Fantasy Spa range option that is ideal for space-conscious customers. It comes in at 72” x 72”x 31”and has a dry weight of 302lbs and 205 gallon capacity. Two ergonomic seats are featured within the design, along with a ‘cool down’ area, and there are 17 jets that include dedicated foot and wrist jets. All three 240v rugged ‘plug and play’ models can be plugged into a standard socket to power the topside electronic controls for temperature, lighting, and water flow pressure control convenience. They offer a dual speed therapy system to allow users to enjoy the comfort of warm water while being gently massaged, or have the ability to increase the power for a more vigorous deep-tissue massage.